This cross-company licensing can be traced back to at least one designer, Christian Dior. Many know of the jewelry marked “Christian Dior by Kramer,” “Dior by Kramer,” or “Kramer for Dior,” but until recently we didn’t know the nature of this arrangement. It’s important to note the word, “execute.” If Kramer of New York did in fact use jobbers, this would stand to reason for the use of the terminology, “execute” rather than “manufacture” the jewelry. Additionally, and perhaps to create an intriguing marketing story, Mr. Kramer stated part of the Dior venture would introduce jewelry designs previously exclusive to the Paris market. 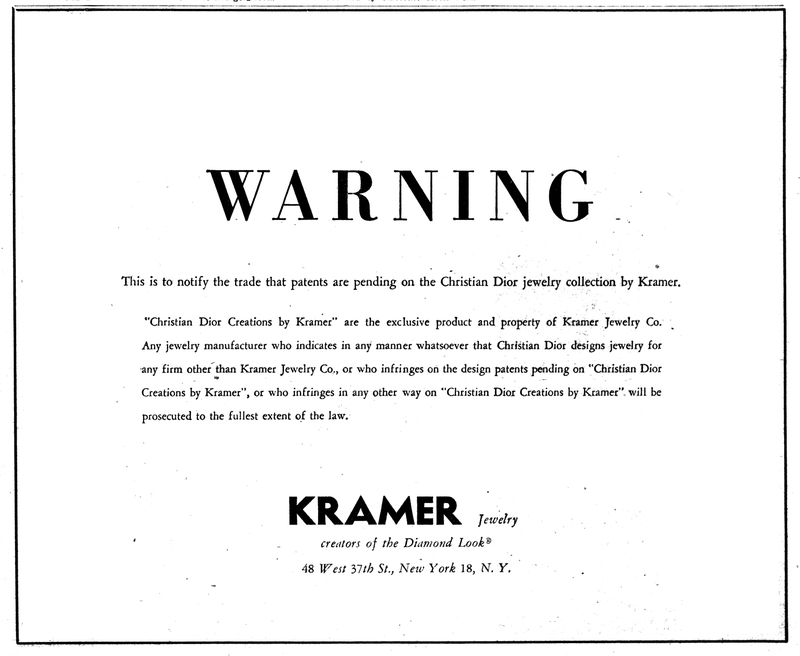 Kramer indicated a group of Dior-Kramer branded jewelry would be presented in the United States with copyrighted protection. In part, due to the limitation of strategic metals affected by the Korean War, much of the line was to be produced in silver metal. However, the most prominent challenged that faced this company and others during the first couple of years of the 1950s was the supply of stones. (Please note the author can find no examples of sterling Kramer or sterling Christian Dior for Kramer jewelry.) During the stone shortage period, the three brothers traveled throughout the United States salvaging anything that had stones which could be removed. This included items such as belts, handbags, and clothing. To facilitate the collaboration of this line, Mr. Kramer took extended trips to Europe to help develop the line and take note of the European jewelry fashions which no doubt influenced the Dior partnership. Mr. Kramer and others continued this practice for many years. These extended branches of the Dior brand were carried out under the condition that the product was manufactured, marketed and distributed in the same manner as other Dior product lines. 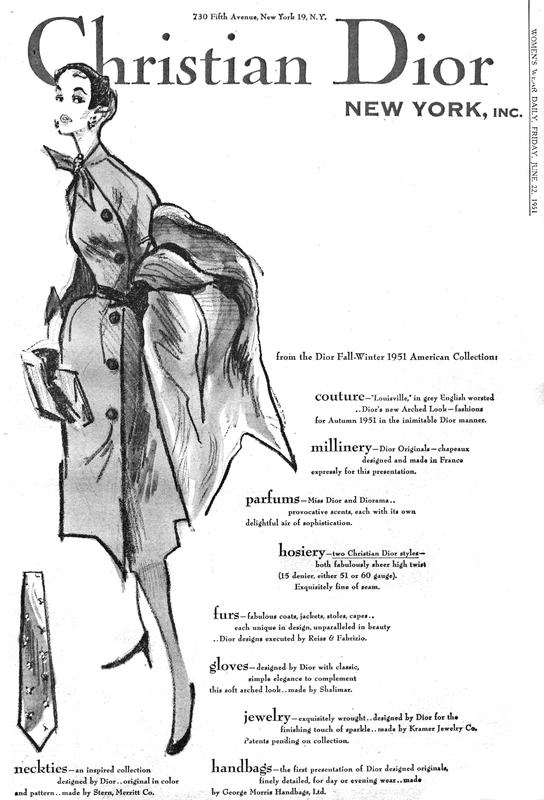 In 1953, under the direction of Henry Ash as director of the Christian Dior line, the company implemented its most extensive marketing campaign to dates, covering both trade journals and consumer magazines. However, at the time of this post, the author cannot find any advertising of product using by the Dior and Kramer name. 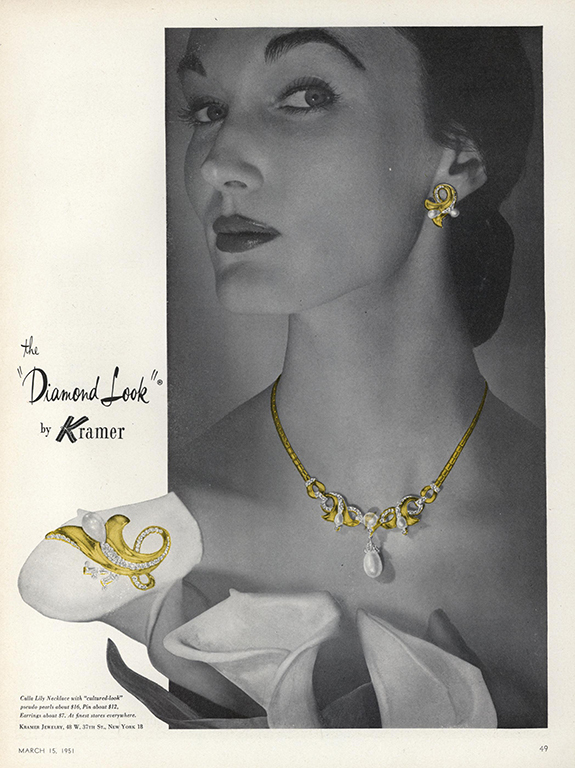 This quick inquiry into the history of the Kramer Jewelry Co. and its collaboration with Christian Dior still has many unturned stones. The most pressing for me is when did the collaboration stop? And when did other companies start producing the Christian Dior line made for the American market?